Inside the Red Cliffs NCA, looking east toward Green Springs, along the route of the proposed Northern Corridor. Conserve Southwest Utah is committed to protecting the many values of this land by readying our community for involvement in the NEPA process. After Conserve Southwest Utah helped defeat legislative efforts in late 2018 that would have forced development of the Northern Corridor, Washington County began a complex process of attempting to “write” the highway into the renewal of the Habitat Conservation Plan. 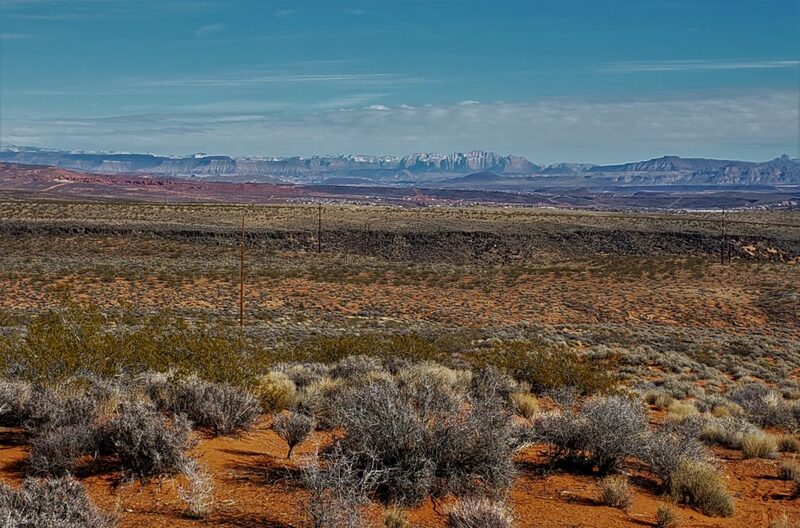 In 1996, the Washington County Habitat Conservation Plan (HCP) created the Red Cliffs Desert Reserve and opened over 300,000 acres for development. The plan expired in 2016, but has been operating in good faith as the county works toward renewal. The County has hired environmental consultants to manage 3 connected actions designed to force the highway development that can be thought of as 3 legs on the Northern Corridor Bar Stool: 1- Amend the existing HCP that protects critical habitat for the threatened Mojave Desert Tortoise to expressly allow the Northern Corridor, 2- Apply to the Bureau of Land Management (BLM) for a right-of-way corridor for the highway, and 3- Amend the Resource Management Plans (RMPs) for the Red Cliffs NCA and the St. George Field Office to allow the highway. This work is happening now, and will trigger the NEPA process beginning this summer with scoping. This is where you can help Conserve Southwest Utah counter these actions and continue to protect the Red Cliffs NCA for generations to come. First, to prevent the proposed Northern Corridor from fragmenting the Red Cliffs NCA, we must showcase a strong and diverse chorus of voices able to speak about the values of this precious place. CSU is committed to full participation in NEPA- and inviting you to participate too! NEPA is designed to take a “hard look” at environmental impacts of the proposed highway and analyze a range of alternatives. We will draw on lessons learned from the creation of RMPs that encouraged high levels of protection for the Red Cliffs and Beaver Dam Wash NCAs in 2015. Community engagement in NEPA is critical and we will count on you to help speak out. This requires community organizing on behalf of our public lands. So, to get started, CSU will offer educational and fun hands-on-the-land programs for people of all ages – with the goal of introducing our diverse community to the great ecology, scenery, wildlife, recreation, culture and science of the Red Cliffs NCA. Second, we will prepare both new supporters and tried-and-true advocates for commenting on each of the county’s 3 interconnected actions (or each of the legs of the bar stool). CSU will provide NEPA outreach and education, including stakeholder meetings and workshops at every stage of the process with special attention to helping people craft substantive comments. Anyone who cherishes the Red Cliffs NCA, has firsthand knowledge of its values, and can point out risks that the highway poses to its resources can write NEPA comments. Conserve Southwest Utah will be there to help. We urge you to stand and speak out with us to protect our Red Cliffs NCA! Success could take one these forms: the US Fish and Wildlife Service (USFWS) could say “no” to the Northern Corridor in Washington County’s Habitat Conservation Plan renewal; the BLM could deny the right-of-way for the Northern Corridor; or Conserve Southwest Utah could lay the firm foundation necessary to appeal a bad decision. Encouraging the BLM and USFWS to choose conservation in the face of great pressure to weaken environmental protection hinges on our ability to demonstrate a strong and united front. Working closely with our existing allies, making new ones—and you— will help to protect public lands and community resilience. Protecting our public lands requires community involvement, and making new friends is important! CSU was thrilled to add 40 new members as a result of great conversations at the Transportation Expo. They offered quality feedback on CSU’s proposed transportation alternatives, suggested some new ones to consider, and affirmed what many of us know: the county did not adequately involve the public in decision-making and failed to consider viable alternatives to running a highway through the heart of critical habitat. We will continue working with well-respected organizations and sovereign entities that have standing in our community and consistently give back through service and education. The local Back Country Horsemen of America chapter, the Desert Tortoise Council, and the Shivwits Band of Paiutes are strong partners in the work of protecting the Red Cliffs NCA and we thank them for their spirit.